Welcome Home! Tonight at 6:30! Goodhue Wrestling invites you to a Welcome Home celebration of our wrestling team, 3 state entrants and State Champion Bailee O’Reilly! We are excited to see you in Gym #2 and the Commons to share in the highlights of the 15-16 season and Goodhue’s newest State Champ since 1998! Section 1 is ready to get together for its annual bash at the Mayo Civic Center for Individual Sections, as teams from all over SE MN are set to collide on Friday and Saturday. By Saturday night, only a handful of wrestlers will be left to compete in the State Tournament. Last Saturday, Goodhue competed well but fell short in its goal of upending #1 seed Z-M. Overall, the dual was a success, as the team reversed a 39 point defeat from December into a 13 point loss, notwithstanding an unfortunate injury default that would have been a likely 9+ point swing alone that would have further closed that gap. Individual Sections open with first round and quarter-final action beginning at 2:30 for Class A and AA. Saturday begins with championship semi-finals at 11:00 and consolation semi-finals at about 1:30. The final session starts with the 4:45 Parade of Champions and Championship and 3rd Place matches to follow. Here is the link to a PDF file of the the Section 1A brackets. You can also view results by going to www.trackwrestling.com and then click on “Browse” then “Tournaments” then “Search Events” then type “Section 1A” and hit “Search”. Then Enter as “viewer” and then in “Results” click on “Brackets.” We will also post results in our Twitter feed. 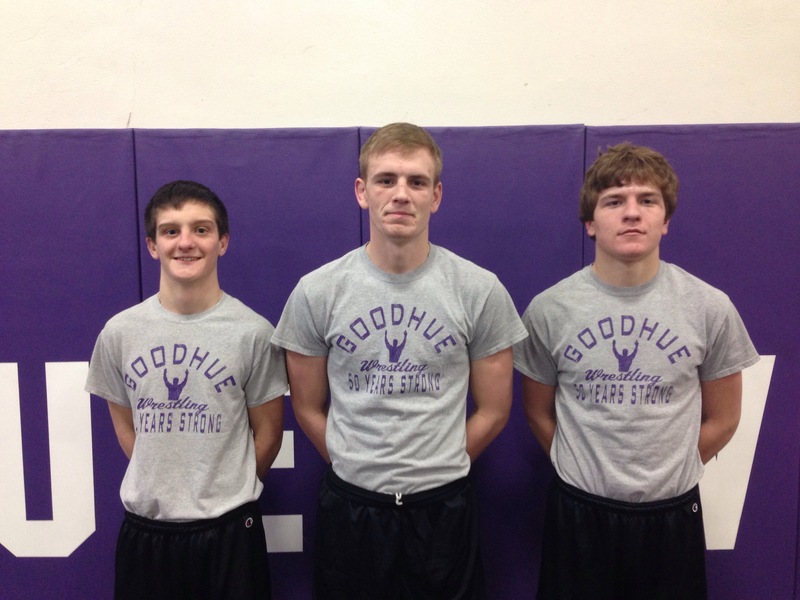 Goodhue Wrestling finished the 2015-16 regular season with a 14-9 record and earned the #4 seed in the Section 1A post-season. Yesterday Goodhue hosted the #5 seed Wabasha-Kellogg and #12 seed FCLMC. In the first round of the tournament, W-K easily moved past a short-handed FCLMC to face Goodhue in the quarter finals. With a 50-21 win, Goodhue advanced to the semifinals for the second time since 2005. In 2013, Goodhue fell in the semis 38-34 to the #1 seeded Chatfield, who two weeks later became State Champions. Goodhue will face the #1 seed and 10th ranked Z-M in the semifinals at 11:00 a.m. at the Mayo Civic Center. The winner will advance to the 1:00 p.m. Section Finals. In anticipation of the inclement weather projected for Tuesday, when Goodhue was scheduled to host Kasson-Mantorville, the dual has been rescheduled for Friday, February 5th. The normal dual times of 6:00 JV and a 7:00 Varsity start are still the same. The location will change, however. Because Goodhue Boys Basketball already is scheduled to host a game in Gym 2, we are going to try hosting a dual in Gym 3 (the new gym). We hope to see everyone Friday night to relax and watch some wrestling after digging out from the storm!